Yes, victory! The last piece in my summer 6-PAC is finished! It is this red cardigan, which in my original plan was magenta. I could not find any magenta knit in a suitable weight. So red it is. This is Simplicity 2603, the cardigan I’ve been admiring on Sharon for years. I made view D but lengthened the sleeve to wrist length. The only fit alteration I made was a ½” low neckline adjustment on the back. After the cardigan was finished, the large collar felt like a thick sock around my neck and added weight without adding anything to the look. So I decided to chop off six inches from the width of the collar. See the faint red line? That’s where I cut it. 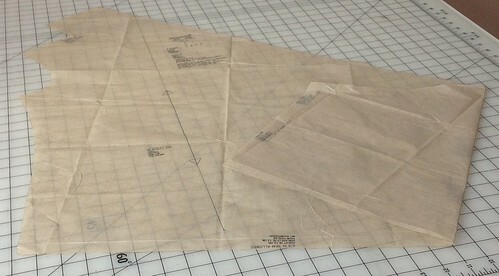 I then folded the collar to the inside and stitched in the ditch of the center back seam to hold it down. The new look is clean and neat around the neck. Much nicer looking pattern piece, it doesn’t seem so huge. This knit took two full days to dry on the drying rack because both selvages rolled up tight. 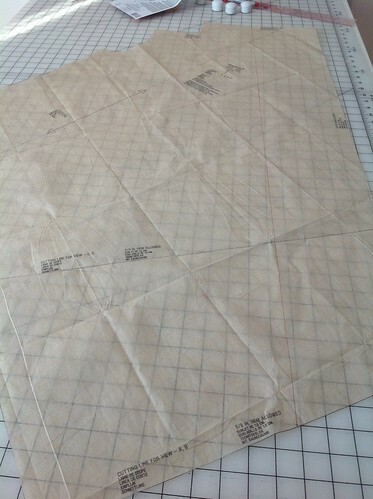 And it was a real pain to lay out because of the rolling, which did not improve even with ironing. Actual cutting was easy. After the tricky laying out, I wondered how it would be to sew. There was a little bit of rolling at the edges that was easily controlled by pins and fingers, and some waving after stitching on the sewing machine that steamed out flat without a problem. Other than that, no issues. I’ll see how this fabric wears but from the sewing standpoint, I’ll be happy to use it in future projects. See the rolled up edges? There’s a lot more fabric there than it looks. Searching for reviews of this pattern, I found many people left the edges unfinished. I considered it, even hiding the serger threads nicely, but in the end, it wasn’t the right look. 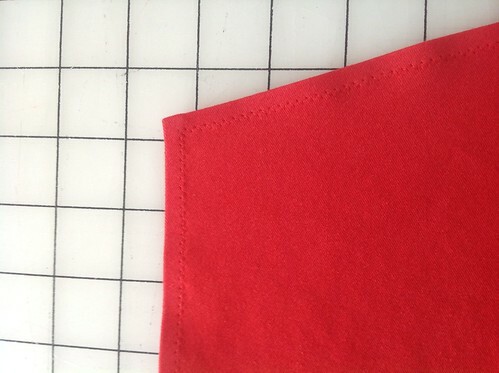 I used Steam-a-seam to hold down the ¼” seam allowance and sewed it with a zigzag stitch (2mm length, 2mm width). I tried to wear it without the belt but this fabric just doesn’t have the drape to hang close to the body so it looks like I’m wearing an awful lot of fabric. Belted is perfect. I would like to find an elastic belt for it, though. I love this cardi and plan to make it again, probably in lime green. (You knew that was coming, right?) This is a good length for me so I probably won’t be making the longer version. 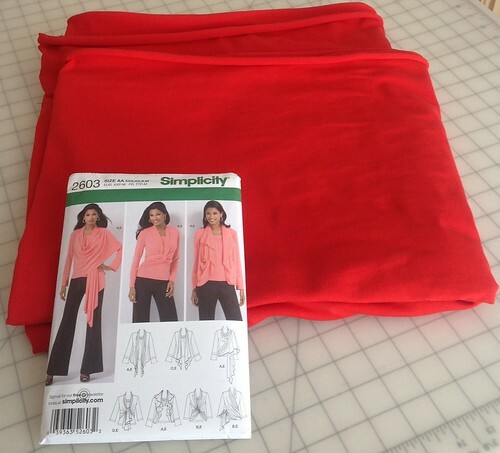 This entry was posted in sewing, wardrobe planning and tagged Simplicity 2603. Bookmark the permalink. Really nice cardigan, and the red looks terrific on you. I think like green would be great too. I’m also an American in Germany, living in Stuttgart while my husband works for the military. Service Credit Union offers the Giro debit card, which I think is the type of card you need when they won’t take your US Visa or MC. I love the changes you made to the cardigan to make it more you! I also love the backstory on how the fabric was acquired. Looks great on you. Good colour for you. You look really sharp! Congrats on finishing your 6-PAC! I like the modifications, less billowy fabric everywhere is better for someone with your frame (plus, less to go under the belt). Great cardigan. I’m on a wrap cardigan hunt and this pattern is calling to me. Even louder now I see your great version! Congratulations on completing your 6-pack! This is the piece de resistance! Thank you, ladies, very much for all the compliments! @Lori: Thank you for the information. I will check with Service CU. @SewingElle: Good luck with your hunt! I’m looking forward to seeing your creation. Love your red cardi and can’t wait to see the lime green one! Thank you for the compliment on my cardi’s.